If you’ve ever browsed through the options for click lock hardwood flooring, you’ve probably run across a product called Longstrip or seen labels listing flooring as 1-strip, 2-strip or 3-strip. Longstrip flooring has a tendency to confuse consumers and, so, in this post we’re going to try to expand on what this engineered Longstrip flooring actually is. Longstrip flooring is an engineered floor. It typically features click locking edges and ends, for an easy and fast installation. Although the most popular method of installation of Longstrip engineered flooring is a floating installation, most Longstrip floors can also be glued down directly to the subfloor if needed. 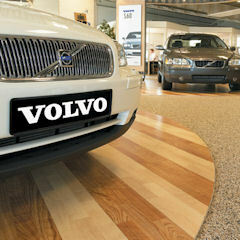 Longstrip flooring is typically 3 ply — the hard finished top wear layer of wood, the core and then the base. Longstrip planks are generally a lot longer than standard engineered flooring. For example, the Kahrs Original Collection Longstrip flooring planks measure out at around 95 IN. long while your typical engineered plank most likely be in the 48 IN. long range. Most Longstrip floors, expecially the 2-strip and 3-strip feature square edges and ends for a seamless and smooth end result. What confuses most people about Longstrip flooring is the surface visual and the language used within the industry. The terms 1-strip, 2-strip and 3-strip are thrown around by sales people and seldom explained adequately. You can see in the picture posted above 3 different styles of Longstrip flooring. Using the Kahrs Original Collection of Longstrip flooring as an example, we’ll say all three samples shown above are planks which are 7-7/8 IN. in width. In the picture to the far left, labeled 3-strip, it shows three distinct strips on the one 7-7/8 IN. wide plank. Therefore, the visual you’re going to get when you install this one plank is that of three strips (about 2-1/2 IN. wide each) going across. The same principle applies to the 2-strip and the 1-strip. If you have a 7-7/8 IN. 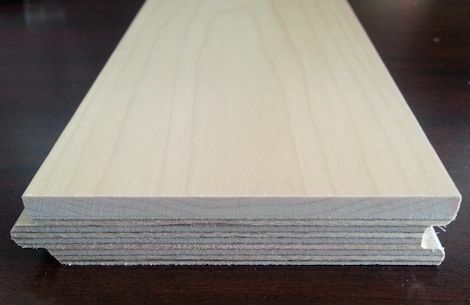 wide plank, a 2-strip product would give you the visual of boards approximately 4 IN. wide when the plank is laid down. The 1-strip would give the visual of one whole plank of wood, 7-7/8 IN. wide. Keep in mind that different manufacturers may have different total widths of their Longstrip planks, this is just the most popular Longstrip width from Kahrs. In this image, you can see how the Longstrip also offers random length strips within each 95 IN. plank. Generally, with a 3-strip Longstrip product, you can expect 17+ random length individual strips within the 95 IN. plank length. Consumers choose to go with Longstrip for different reasons. Firstly, Longstrip engineered planks can go in virtually any room of the home and are accommodating to any grade level. Their construction offers more dimensional stability than your typical solid hardwood floor and are thus more resistant to severe expansion and contraction when atmospheric moisture conditions change. In addition to being able to install Longstrip in any room of the home, it also can be floated over a variety of different subfloor types, including existing tile or vinyl flooring. This negates the need for a messy rip up prior to installing the new hardwood flooring. Their ease of installation is a huge draw, especially with homeowners who are looking to install new hardwood flooring themselves. DIY installations are incredibly easy with Longstrip. The click lock technology means no messy glue. The only accessory necessary for a Longstrip installation is an underlayment for a floating floor, which is simply rolled out over the subfloor prior to clicking the planks together. Longstrip is also a super quick install. Because the planks are so wide and so long, a huge square foot area is covered with each plank put down and an average sized room can be installed in a couple of hours. And, once the Longstrip flooring is installed via the floating method, you can walk and live on it right away. Canada is known for many things. Hockey. 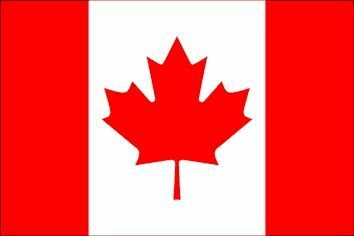 The maple leaf. Excellent health care. Lakes. You can now add hardwood flooring to that list. But why are Canadian brands flying past the competition when it comes to hardwood flooring quality? In the flooring industry, the general consensus is that hardwood flooring products coming out of Canada are simply the best. One of the major benefits that Canadian mills have over other hardwood flooring manufacturers is that their machinery is constantly improving. With every technological advance, Canadian mills update their processes, ensuring that the best quality product on the market at the time is leaving through their warehouse doors. Firstly, technological advances in machinery have made sorting raw material by grade easier. By taking out dependence on the human component and sending each plank through a computer to scan for character and color percentage, the Canadian mills offer grade levels with the smallest margin of error. But that’s just the tip of the iceberg. Technology currently in place tests for moisture content in multiple areas of each board, identifies optimal pieces for longer average lengths and determines the best finishing side of the particular plank. And, all along the way are quality check points. Lauzon boasts that throughout their entire manufacturing process, there are over 75 quality control checkpoints; a much higher number than your average hardwood flooring manufacturer. The steps Canadian mills are taking to continuously improve technology are mutually beneficial for both the end consumer and the manufacturer. The end users will have hardwood flooring that will stand the test of time as well as peace of mind that they chose the highest quality flooring available. The manufacturer minimizes waste by using this advanced technology, therefore reducing costs and improving their ROI. All of these advanced processes cost a pretty penny, but for these premium Canadian manufacturers, ensuring a consistent high quality product to their end consumer is worth every cent. Aside from having the most state of art machines, Canadian manufacturers definitely make the effort to educate their sales representatives and retail family. Of the top three Canadian manufacturers that we carry (Muskoka, Lauzon and Mont Royal), all three send their sales reps to our showrooms on a regular basis to update samples and educate our sales force on any new features/products. These sales reps for the Canadian mill are incredibly knowledgeable and constantly in touch, making it easier to sell their products and enforcing the fact that the end consumer is their number one priority. 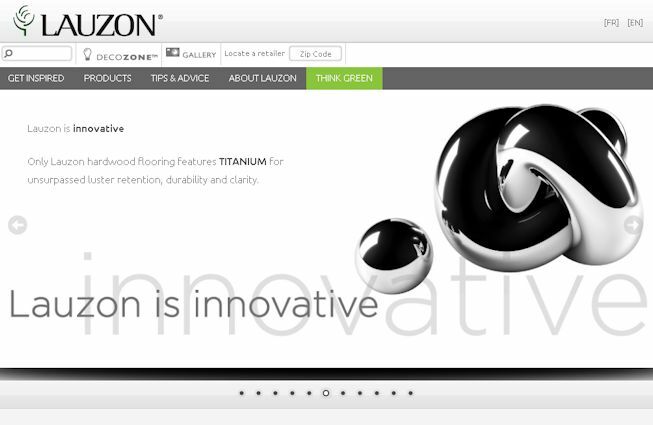 Furthermore, companies like Lauzon make sure their line of communication with the end user remains convenient and open by using their websites to supply the most up to date information on their products and their brand. Ultimately, when you choose one of the premium Canadian hardwood flooring brands, you can rest assured that you’re getting the top quality that you’re paying for. Figuring out which molding or transition piece will be needed to complete a room has a tendency to be a bit confusing for the average homeowner. The following resource is meant as a guide, hopefully making it a little easier to understand which moldings are beneficial for specific situations. Keep in mind that real wood moldings can differ slightly from laminate moldings. Additionally, one manufacturer may have a slight variation in their version of a molding from the next manufacturer. Moldings and transition pieces offered by manufacturers are often designed to match the color of a specific floor that they offer. It’s important to understand that moldings may not match floors exactly, because wood is a natural product and one piece can take a stain a little differently than another. Typically molding lengths are 78 IN., but this can differ from brand to brand in the industry. The following descriptions offer a general guideline for some of the most popular molding and transition types. Dimensions and profiles may differ slightly from manufacturer to manufacturer and the general descriptions below are meant only for general guidance. One of the most popular type of molding is called a Quarter Round. Quarter Rounds are typically 3/4 IN. by 3/4 IN. and are used to cover the necessary expansion gap between a hard surface floor and a wall. Read more about expansion gaps here. Along the same line as Quarter Rounds, some manufacturers offer a molding called a Shoe Base. Shoe Bases are typically a little thinner or a little shorter, but work in the same manner as a Quarter Round. While most manufacturers offer Quarter Round to match (as close as possible) the color of their specific floor, it’s common to see Quarter Rounds painted or stained the same color as the rest of the trim in the room. Installation of Quarter Round is very simple and is something anyone can do. Simply nail the Quarter Round (or Shoe Base) into the baseboard or the wall using 6 penny finish nails approximately every 10 IN. 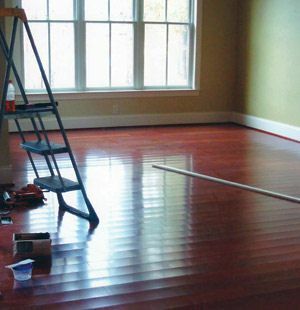 When preparing a room for a new installation, it is necessary to remove existing Quarter Round prior to installing the new flooring. Quarter Round can be used alone, or it can be used in conjunction with a Wall Base (baseboard). Another popular molding used to cover expansion gaps is a Wall Base. Wall Base heights differ from manufacturer to manufacturer but typically can range anywhere from 2 IN. high to 5 IN. high. Wall Bases can be plain and generic or very decorative and, like the Quarter Round, homeowners usually prefer these moldings to be painted or stained the same color as the rest of the trim in the room. Wall Bases are installed using 8 penny finish nails, nailing approximately every 16 IN. and can be used with a Quarter Round or without. T-Moldings are aptly named, as the profile resembles a capital T. A T-Molding is used in situations where you’re transitioning from one hard surface to a second hard surface. The top part of the T-Molding overlaps both hard surfaces. It’s incredibly important that these two hard surfaces are the same height, as, if one side doesn’t have the appropriate support, that side of the molding will start to crack once it’s being stepped on. 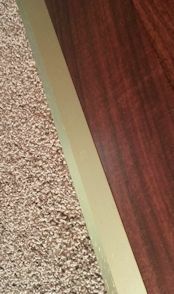 The same reasoning goes for why the T-Molding can not be used to transition to carpet, there’s just not enough support. If hardwood flooring is being floated across a few rooms, it’s always recommended to use T-Moldings in doorways. 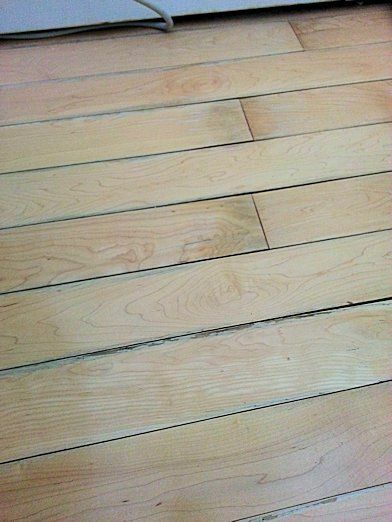 In larger areas, an expansion joint is also recommended if floating hardwood flooring layout is going to exceed 30 FT. in any particular room. To install a T-Molding, a space needs to be left between the two hard surfaces. The transition piece is then glued down where it meets the subfloor using construction adhesive. It’s recommended to place a heavy object on the newly glued T-Molding overnight, in order to ensure a tight bond. In addition to being glued down, you can also choose to face nail the T-Molding (in the middle of the T-Molding) to the subfloor using 8 penny finish nails. When you’re installing a hardwood floor using a nail, staple or glue down installation, a Flush Reducer can be used to smoothly transition the new hardwood floor down to a second flooring type, such as vinyl, tile or even low pile carpet. Flush Reducers can be glued to the subfloor with construction adhesive and/or face nailed using 8 penny finish nails. A Flush Reducer can only be used with flooring that is secured to the subfloor (nailed, stapled or glued down) and not with a hardwood floor or laminate floor that is being floated. This is because a floating floor needs room to move and a Flush Reducer would not allow for the necessary expansion gap. For transitions from floating floors, the use of an Overlap Reducer would be necessary. When installing a floating floor, it’s incredibly important to leave expansion gaps where the new flooring meets up with walls or with a second floor. Overlap Reducers were created for the purpose of transitioning smoothly from this floating floor to a second floor (vinyl, tile, carpet, etc.). Much like a Flush Reducer, an Overlap Reducer gradually slopes down to meet the second floor, but instead of locking in flush with the hardwood, an Overlap Reducer has a small protruding piece which will overlap the floating hardwood or laminate flooring. The purpose of this overlap portion of the transition piece is to hide the expansion gap left, allowing the floating floor to move without restriction. To install an Overlap Reducer, simply glue down to the subfloor using construction adhesive and/or you can face nail into the subfloor using 8 penny finish nails. Do not adhere the Overlap Reducer to the actual hardwood or laminate flooring at all. The overlap part of this transition piece is meant to simply rest on the floating floor. Sometimes referred to as a Baby Threshold, Thresholds are used in situations where a hardwood or laminate floor is meeting up with a second floor of a different height. Instead of a gradual slope, like a Reducer, a Threshold has a rounded off square edge appearance. Thresholds are perfect when butting a hard surface floor up to a high pile carpet and are also often used when hardwood or laminate floors are meeting up with a sliding glass door track. A Threshold will overlap the hardwood or laminate floor and create a defined transition to this second surface. To install a Threshold, simply glue down to the subfloor using construction adhesive and/or you can face nail to the subfloor using 8 penny finish nails. It’s important to note that if you’re using a Threshold with a 3/4 IN. thick solid hardwood floor, the bottom of the molding may rest at approximately 1/4 IN. above the subfloor. The Threshold can still be used. You would just need to use a heavier bead of construction adhesive or use a filler piece on the subfloor under the bottom of the molding to offer more support to the Threshold. Square Nose Reducers are very similar to Thresholds but have a more squared off edge. Typically used with floating floor, a Square Nose is perfect for butting hard surface floors up against vertical obstacles, where a Quarter Round or Wall Base would be difficult to use to cover an expansion gap (brick wall, fireplace, sliding glass door, etc.). 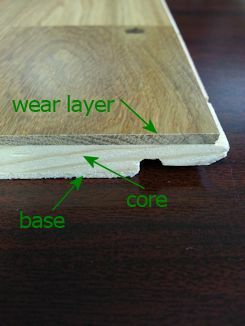 The Square Nose Reducer overlaps the hardwood or laminate floor, hiding the expansion gap with the overlapped portion of the molding. Installation of a Square Nose Reducer would involve using construction adhesive to glue the transition piece to the subfloor and/or face nailing the piece to the subfloor using 8 penny finish nails. Stair Nose pieces are sometimes also referred to as Bull Nose pieces or Step Downs. Stair Noses are used on the front edge of a step when you’re using the actual floor boards to cover stairs. The Flush Stair Nose butts right up against the floorboards and creates a seamless transition to the end of the step. Flush Stair Nose pieces can only be used in conjunction with a nail, staple or glue down install. Stair Nose pieces are installed by gluing down to the stair subfloor using construction adhesive in addition to face nailing. When face nailing Flush Stair Noses, you should use two 8 penny face nails approximately 3 IN. in from the end of the stair on both sides and then two 8 penny face nails in the center of the Stair Nose. If your stairs are extra long, you should aim for two face nails approximately every 20 IN. 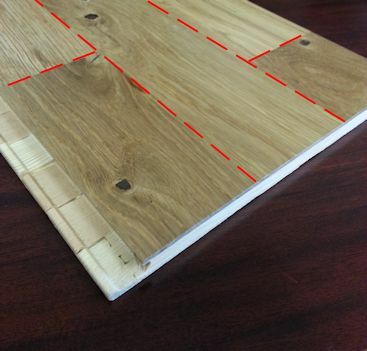 Floating applications require a different kind of Stair Nose: one which can allow for the required expansion gap for floating hardwood or laminates. Overlap Stair Noses have a small protruding piece which overlaps the floating floor and hides the expansion gap, leaving room for free movement of the floating floor. As you can’t float floor boards on individual stairs (boards need to be attached to the individual stair surface), Overlap Stair Nose pieces are typically only used at the top of the staircase, where it would be transitioning from a floating floor down to the first step. Overlap Stair Nose pieces are installed a lot like Flush Stair Nose pieces. Glue the Overlap Stair Nose to the subfloor using construction adhesive, making sure to leave enough room for the required expansion gap. In addition, using two 8 penny face nails, nail down the Overlap Stair Nose approximately 3 IN. in from each end as well as in the center of the Overlap Stair Nose piece. If the stairs are extra long, make sure to face nail two 8 penny finish nails at approximately every 20 IN. of the molding. It’s important, with Overlap Stair Nose pieces, that you remember to attach the molding to the subfloor and not to the floating floor you’re overlapping. For those who want a fast and easy option for tackling stairs, there are Stair Treads. A Stair Tread is basically a whole piece of finished stair which you simply glue and nail down and then you’re done. Stair Treads negate the need for Stair Nose pieces and individual floor boards, saving a lot of install time. Also available, are Stair Risers, which are the vertical part of the stair. Most hardwood flooring and laminate flooring manufacturers don’t produce Stair Treads to match their products. However, there are independent companies which specialize in Stair Treads and Risers and offer them in a variety of sizes, styles and stain colors. These companies can even closely match a floor if a sample is sent to them. Most hardwood and laminate flooring manufacturers don’t produce their own prefinished Air Vent Grilles, but, like the Stair Tread and Stair Risers, there are companies out there that will provide you with a custom size and style Air Vent Grill to match your new flooring. Specifics these Air Vent companies will need to know will be the actual size of your vent, what kind of frame you’re looking for, whether you want a damper on the grill, wood species and/or stain. The above molding descriptions describe some of the most popular molding and transition options. Sometimes, though, specific manufacturers will have moldings available that are exclusive to their collections. 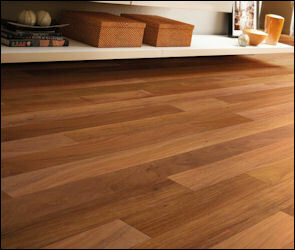 For example, QuickStep Laminate Flooring offers a 5 in 1 Multifunctional Molding. This molding, which is very specific to QuickStep, comes with a cutting tool and allows the installer to cut the molding to form one of five moldings: T-Molding, Hard Surface Reducer, Carpet Reducer, Square Nose Reducer or Flush Stair Nose. Many laminate manufacturers make their own version of this Multifunctional Molding. Versatile moldings like this are beneficial for consumers who at the time of placing an order are unsure of which specific molding they will need, but want to make sure they have something there to use when it’s time to finish the install. 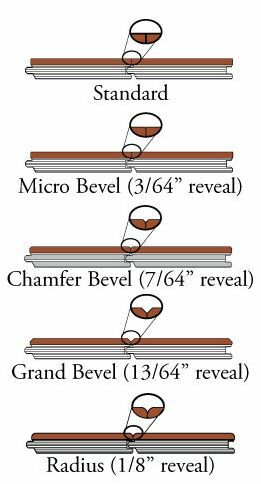 Sometimes, during an installation, a homeowner will find that none of the generic moldings will suit his or her specific need. In this case, custom moldings can be made to fit any situation by an independent carpenter in your area. Additionally, moldings don’t need to necessarily match your particular flooring. As mentioned previously, many homeowners like to stain their Quarter Round and/or Wall Base to match the rest of the trim in that room. Along those same lines, metal or rubber or stone moldings are often seen in commercial settings and even in some residences. Exotic Hardwood Flooring has certainly made a splash in the market lately, becoming a highly sought after trend for homes across the United States as a more exciting option than traditional oak flooring. Known for deep, rich natural coloring and superior hardness, exotic wood species are a way to add a unique touch to your home. Some of the more popular exotic wood species include Brazilian Cherry and Santos Mahogany, but there really is a huge selection of exotic species across the spectrum — from light Amendoim to dark Brazilian Walnut and every tone in between. There are a few things you need to keep in mind if you plan on adding an exotic hardwood floor to your home. Firstly, what you see isn’t necessarily what you get. Exotic hardwood flooring is prone to getting darker and richer in color with exposure to light. It’s important when looking at samples of exotic hardwood flooring from a flooring store to remember that these samples probably have been out of the box for quite awhile and are currently either in the process of maturation or even fully matured. When you open up a fresh box of exotic wood, you’re going to find that the exotic wood boards could be slightly or significantly lighter than what you’re expecting. It’s common for homeowners to panic at seeing these lighter boards, but rest assured, exotic woods do change color and take on richer tones over time with a complete maturation time frame of approximately 6 months. Secondly, it’s important to keep in mind that exotic wood species typically feature a wide variation of color. For example, with a Brazilian Cherry floor, you could find colors ranging from pale blondes to deep reds and everything in between. It’s always a good idea when looking at samples of exotic hardwoods to look at larger display boards or at least a few samples of different boards (not just one swatch). Brazilian Cherry seems to be one of the most extreme of the exotic wood species when it comes to color variation, but with any of the exotic wood species it’s still a good idea to plan out your room prior to installation. Open up 4 or 5 cartons of the material and actually place boards out mixing from different cartons, making sure to create a balanced appearance across the entire room. Homeowners love the mosaic of colors that exotic woods tend to create once installed and it easily becomes a focal point of any room. Additionally, exotic wood species are typically a lot harder than their domestic counterparts. This doesn’t mean that exotic hardwood flooring needs less care. It’s incredibly important to take good care of exotic hardwood flooring, just as you would any other flooring in your home. Exotic hardwoods can still scratch and dent if you drop something heavy enough on it. Because exotic wood species are harder, the dent might not be as deep — but it will still be there. Take care to regularly sweep or vacuum up dust, dirt and other particles from your hardwood. 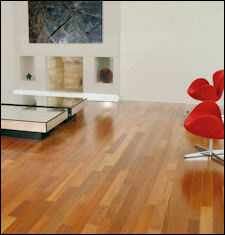 Clean exotic hardwood flooring with approved hardwood flooring cleaners, such as Bona Kemi, to ensure a beautiful shine. Use chair glides on furniture and mats at doors leading to outside. These steps will ensure a long, beautiful life for your exotic hardwood flooring. Manufacturers, taking note of this surge in demand for exotics, have made it easier than ever to find exotic wood species in all sorts of flooring constructions: solid, engineered, handscraped, click lock, laminate, vinyl, etc. This makes it convenient for you to add the beauty of exotic wood to virtually any room of your home. 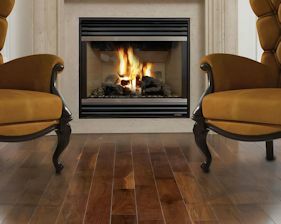 For more information on specific exotic wood species, check out our article: Choosing a Hardwood Flooring Wood Species. Also important when you’re considering an exotic hardwood purchase is the brand. Raw material for exotic hardwood floors typically come from Brazil, although some are found in Peru and other South American countries. To ensure that your exotic hardwood has come from a forest harvested in a environmentally favorable way, it’s best to choose well known brands in the industry: IndusParquet, Nature, and Scandian are all great companies to start your search at. These manufacturers work primarily with exotic wood species and hold main offices and mills in South America. Because these brands typically manufacture right in Brazil, they generally get first dibs on the best raw materials and are able to produce flooring quickly and efficiently. Finished products are then shipped via container to ports in the U.S. (most often in Miami) for distribution throughout the United States. This leads to one of the downsides of exotic hardwood flooring: popular products may involve longer lead times than domestic wood products, simply because they sell out quick and it takes more time to get product across the water and through customs. Overall, exotic woods are a simple way to add warmth and beauty to your home, creating natural mosaics that will last for years and years. The internet has made finding reviews on goods and services easier than ever. Online reviews are a great way for potential consumers to find more hands on information about a specific future purchase as well as for seasoned consumers to voice their opinions on their experiences. But, what happens when a company takes a review site (ConsumerSearch, Yelp, TripAdvisor, Epinions, etc.) and shapes results into more favorable outcomes for their own benefit? This is a common practice (however unethical) in marketing strategies and can trip up consumers looking for legitimate company/product experiences. There are a couple different ways in which companies can force a specific outcome on these review sites. Primarily, a company can search out competitors and post inaccurate reviews against them. As mentioned before, this is unethical, but it takes a dig at the competition and puts the acting company/product in a better light. Secondly, there are specialized marketing companies canvassing the market now which promote the fact that they can get companies more positive online reviews and/or get negative reviews removed. 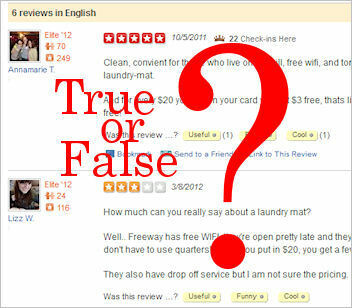 These marketing companies pump out these falsified reviews, deceiving consumers who are simply looking for honest information. Unfortunately, it’s impossible to know whether a consumer review you read online is valid or not and because of this, many online reviews now need to be taken with a grain of salt. Over the years, laminate flooring has gotten a bad rap. 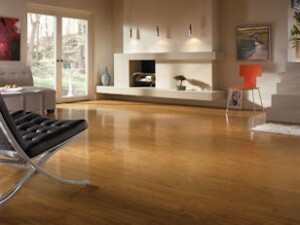 Laminate flooring was originally created as a more durable and less expensive substitution for real hardwood flooring. Invented in 1977 by a company named Pergo, early laminate flooring selections were very limited in realistic aesthetics, appearing quite cheap and fake. This bad reputation has stuck in some consumers’ minds, ultimately dissuading them from even considering laminate flooring as an option in the home. Basically, laminate flooring is created by fusing together a base layer , a core , an image of real hardwood flooring (or stone/tile) , and a top layer of melamine resin . Early laminate flooring images were very primitive, crude replicas of real hardwood flooring planks. Textures on laminate planks were unheard of in these earliest laminate collections, making the boards even less realistic. But, all fake appearances aside, laminate flooring made its mark on the flooring industry because of ease of installation, durability and extreme low cost. As popularity of laminate flooring among homeowners grew and grew, other manufacturers took notice and started developing their own collections of laminate flooring. Pretty soon, research and development took laminate flooring from glued installation to click lock floating installation, making installation even simpler. As technology advanced, so did the possibilities with laminate floor design — especially the simulated images of real hardwood flooring. Manufacturers of laminate flooring are now able to produce amazingly realistic and fashion forward selections, incorporating new gloss sheens, textures, plank styles and more underlayment options. Typically laminate flooring has a very matte/satin sheen, but recently introduced laminates from Bruce and Armstrong (Grand Illusions Melbourne Acacia shown to the left) showcase strong gloss sheens, for those looking for a very elegant, polished look. When thinking of laminate flooring, the image of a flat and plastic looking plank usually comes to mind. With technological advances in the laminate flooring industry, though, manufacturers now can add a variety of surface textures to planks, creating not only an appearance of hardwood flooring, but also a feel of authentic hardwood or tile. It’s amazing how often laminate tiles are mistaken for real porcelain or stone. Laminate flooring has definitely come a long way in satisfying our appetite for realism. Early laminate flooring planks were strictly 3-strip styles with square edges & ends and a very repetitive image pattern. Present day laminate collections offer 1-strip and 2-strip in addition to the 3-strip styles, along with an option for micro-beveled edges & ends. Additionally, manufacturers have increased unique images for colors in their collections, so repetition within the floor is much less than with the earlier laminate collections. It’s not just the laminate planks that have evolved over the years. 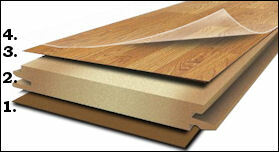 Laminate installation accessories have also become more and more advanced. 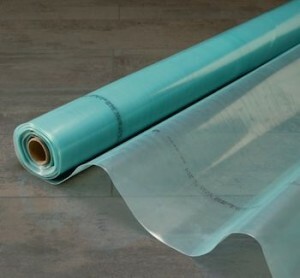 Originally just a thin foam pad used for cushion during floating installations, underlayments now feature attached moisture vapor barriers and sound deadening properties. Felt underlayments have come to the forefront of the laminate industry and some laminate collections (like Shaw Radiant Luster) even feature pre-attached underlayments on each plank, making laminate flooring installation that much easier. Why choose laminate flooring over carpet, vinyl or other flooring types? Because the process of manufacturing laminate flooring is relatively easy, as compared to that of other flooring types, laminate floor brands are quick to update their collections with the newest trends in terms of colors, textures and wood species. Therefore, laminate flooring makes it easy to get very specific looks, styling your home exactly how you like it — whether that be a very traditional direction or a more unique, exotic direction. With laminate flooring, there really is something for everyone. Durability is a huge factor in homeowners choosing laminate over other flooring types. 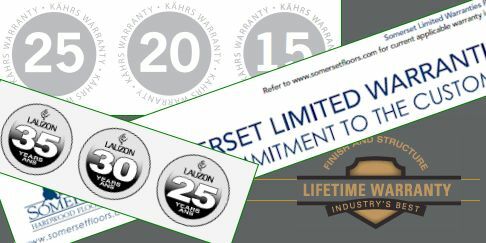 Most of the top brands offering laminate flooring in today’s market guarantee their products with a lifetime warranty in residential settings. Laminate flooring is so durable that most brands also offer a commercial setting warranty, with high traffic patterns in mind. Laminate flooring is known to work well in offices, restaurants and even dance studios. To the left, you can see Alloc durability at work inside a car dealership. So, it’s time to stop holding laminate flooring’s humble beginnings against it and start considering all the beauty, durability and affordability laminate flooring has to offer.